It's the time of year here in Patrick County when the last luscious crop of blueberries is coming in at the Blueberry Hill in Patrick Springs, VA. This family-owned organic blueberry farm is one of the most amazing blueberry places I've ever picked at. These aren't blueberry bushes - these are blueberry trees and for the most part are 6 feet and taller. Incredible and loaded, loaded this year with plump, juicy blueberries. Since the season began in late July, Mike & I and our assistant Innkeeper, Carol, have made several trips to pick for our own pleasure and for stocking the Inn's freezer for all those stuffed blueberry pancakes we prepare as a part of the Inn's four-course breakfast. Carol, being a wonderful cook, has been making the most delicious blueberry pies that I have ever tasted. So I thought you might enjoy having her recipe as much as I do. You will need one double crust pie recipe or use a store bought one though homemade is ever so much better. Line 9 inch pie plate with bottom pastry. 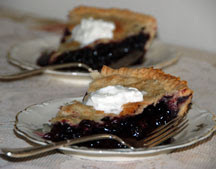 Fill pie shell with blueberry mixture. Sprinkle with 1 tsp of lemon juice. Dot mixture with 1 Tbsp of butter. Place and adjust top crust. Brush with milk and sprinkle with sugar. Bake at 400 degrees 35-40 minutes.